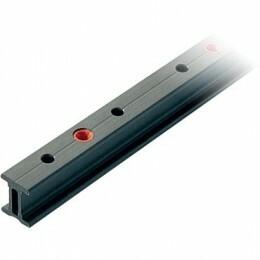 Ronstan I-Beam track & traveler systems deliver the performance required in a variety of applications and conditions. Ronstan systems have been put to the test under the most demanding conditions in the marine environment and in industrial applications around the world. Manufactured from extruded hard anodized aluminum alloy all track sections are available in multiple lengths. Black Chromed Grade 316 stainless steel car bodies, Grade 316 stainless steel wheels and fixtures.